Whether it’s diagnostic imaging or monitoring a condition, MRI is an essential tool in modern medicine. In fact, 3 out of 4 people will likely need an MRI in the next 10 years. Yet for people with a cochlear implant, it can be surprisingly difficult to have an MRI. Many radiologists are concerned about performing MRI scans on patients with cochlear implants. This is because of well-documented complications such as pain or the need for surgical magnet removal. If you’re a radiologist or MRI technologist, you may have even experienced these issues first-hand. What causes these complications? Every cochlear implant has an internal magnet. With other cochlear implants, this magnet can partially or fully dislocate from the implant housing. This causes significant pain that can make it nearly impossible to safely & consistently perform an MRI scan. With this in mind, it’s entirely reasonable for radiologists to be hesitant to perform an MRI on a patient with a cochlear implant. So how can we change the status quo and provide patients & clinicians with safe, comfortable access to MRI with a cochlear implant? This is why we specifically design our implants to deliver superior MRI safety. All MED-EL cochlear implants use exceptionally secure magnet designs. That’s why there has never been a reported case of magnet displacement or dislocation during an MRI with a MED-EL implant. Even better, our SYNCHRONY cochlear implant is the only cochlear implant that lets you safely perform 3.0 Tesla MRI scans without pain or discomfort, and even without any head bandage. SYNCHRONY ensures patients and clinicians have safe, reliable access to 3.0 T MRI scans. 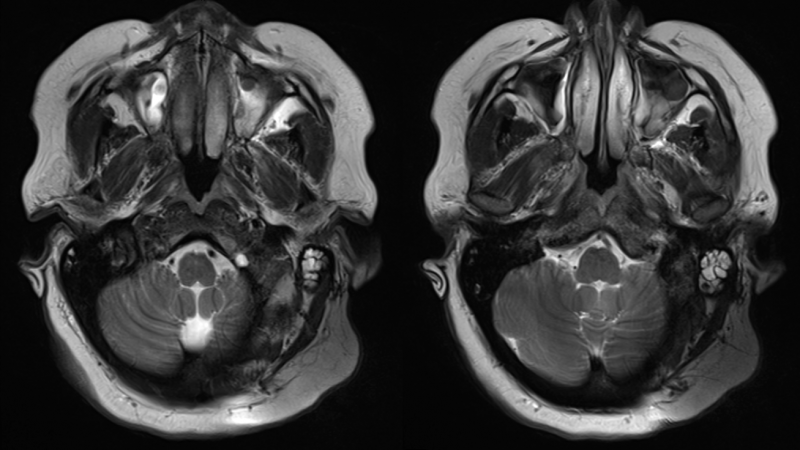 Today, we’re excited to share a clinician’s first-hand experience of performing a 3.0 Tesla MRI head scan on a patient with the SYNCHRONY cochlear implant. 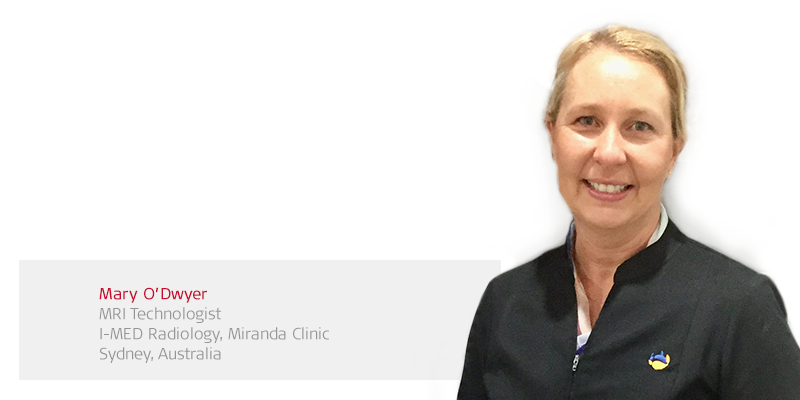 Mary O’Dwyer is an MRI technologist with 30 years’ experience working for I-MED Radiology at their Miranda clinic in Sydney, Australia. This clinic has two Siemens 3T Skyra’s and averages 90 procedures a day. Let’s go over to Mary to hear her experiences of performing an MRI scan on patient with a SYNCHRONY cochlear implant. At our clinic, standard procedure for cochlear implant patients was not to scan them as previous experiences have not been pleasant for patients, so our radiologist decide not to accept these patients. In this case, the patient needed a brain scan at 3T to monitor a suspicious area. We scanned at 3T for the clinical advantage of better resolution to look at her particular pathology. Even though we knew we would be battling artefact, our neuroradiologist always prefers us to scan at 3T if implants are safe to do so. This was our first experience with the SYNCHRONY implant from MED-EL. We were hesitant to scan this patient due to previous experiences with other cochlear implants, but upon talking to Alexander, the MED-EL clinical support specialist, and reviewing the safety information with our radiologist we agreed to proceed. The patient was willing and Alexander was very reassuring and agreed to attend our clinic on the day of the scan to provide support. The SYNCHRONY implant does allow patients to have access to MRI scans without distress, but one must remember to follow the safety guidelines from the manufacturer. We did have to adjust our 3T head scan technique, firstly to keep the scans (going to normal gradient mode and low SAR) at a SAR of 1.6. Patient is not to rotate their head, so we use head phones and padding to prevent this. The image did provide some information, and the patient will need a follow up in 12–18 months but with just T2 imaging. Artifact is extensive on the side of the implant so for all brain scans one needs to consider the area of the brain the clinician is interested in and whether the artifact will interfere or not. We could review techniques further to try and reduce artifact. The patient was nervous due to claustrophobia, so we had this extra challenge, but she did amazingly well considering. The patient did not feel anything at all, no pressure or pain, she reported hearing a clicking type noise occasionally, but nothing uncomfortable or distressing. MRI safety should be at the forefront of all companies that manufacture implants. We definitely would be confident to scan patients with these implants again and would happily talk to anyone else to assist them in performing scans also. At the end the patient said she would happily have another one! Ready to learn more about MED-EL hearing implants and MRI? Learn how MED-EL hearing implants have been designed for superior MRI safety for more than 20 years. Need to see the detailed instructions for scanning a patient with a MED-EL cochlear implant? Check out our MRI video guides for MED-EL cochlear implants and our MRI conditions for BONEBRIDGE and SOUNDBRIDGE. Don’t forget to subscribe to get all the latest articles! Have a question about MRI techniques for SYNCHRONY or our other hearing implants? Let us know with our contact form or leave a comment below.